The future can go forwards and backwards. In Advantageous, the modern world is built on and around technology, where skyscrapers are now part of the sprawling skyline and people talk into their ears, checking emails from AI secretaries – ones so advanced that they’re borderline human. The population has exploded in such a way that bodies curl up in public gardens like wilting flowers. Women are cast out. Education is prized, but youth is exalted, and for citizens of a certain age, employment becomes almost impossible. Indeed, the technologically sophisticated and emotionally regressive world of Advantageous, in less years than we might anticipate, could easily mirror our own. In this over-stimulating environment, children like Jules (Samantha Kim) are born and raised, evolving at a pace too rapid for their unformed minds. Like a baby bird with its mouth wide and agape, unfilled and waiting, the world continually stuffs ideas and information into it, without offering anything of real nourishment. Burdened by theories like ‘de-selection’ (whereby nature, bombarded by choice, kills itself by making the same evolutionary mistakes), and living in a society that hides its ruthlessness beneath the cool veneer of technology, Jules struggles with an existential confusion that belies her youth. Hyper-productivity becomes a mounting pressure, and the harsh nature of mass-competition only serves to undermine any sense of budding confidence. It’s an unforgiving environment, and Jules, rather than a product of her physical age, is instead merely a product of her sociological one. Whether it’s reflective of the wider modern world – or if it’s particular to Jules and her mother Gwen (an understated Jacqueline Kim) – their relationship is a highly cultivated one, revolving around classical music and multilingual interactions. Gwen’s dwindling water supply and drying funds suggests that this isn’t a future that accommodates for unemployment, regardless of background or education. Moreover, the question becomes: are these people working on their achievements for themselves, or simply to better their chances at survival? 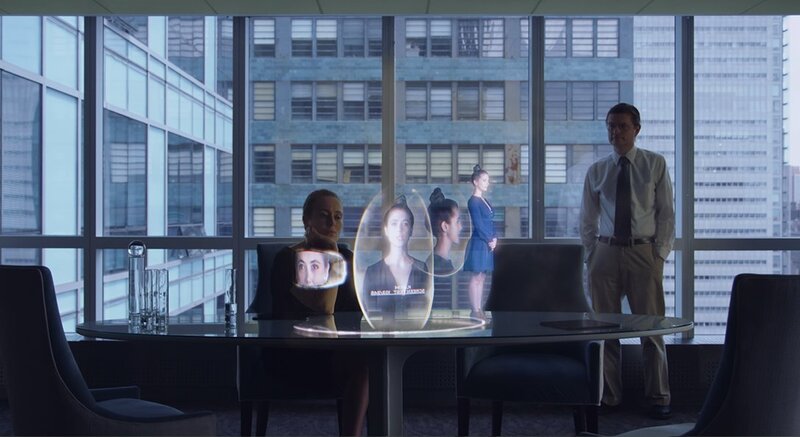 As the face of the Center for Advanced Health and Living, it’s only a matter of time before Gwen is told via holographic conversation that she’s no longer needed. Her face is, well, just not what they’re after anymore, and the company’s moving in, shall we say, another direction. Hiding this from her daughter, and scrambling to find work, Gwen finds that in spite of her impressive qualifications, employment is a tough nut to crack. Jostling for jobs, women have been pushed to the sidelines, and out onto the streets. In a perverted justification of the greater good, authorities claim that having women on the street is a safer outcome than homeless, jobless men. Driven first and foremost by her maternal instincts, Gwen negotiates with her old workplace to resume her former role. Only, the position will change somewhat, and so will Gwen… In the bid to gain maximum commercial advantage from women’s eternal quest for youth, the Center is trialling a new (horrifying) procedure that takes the term ‘invasive’ to the extreme, by transplanting her consciousness into a new, updated body. It’s a risky procedure, but as the days pass her options dwindle. In a world that advertises itself as limitless in choice and advancement, Gwen is herded into the corporation’s one option: Guinea Pig, or Suckling Pig. Running with the theme of technology, there’s an unemotional timbre to the film that – whether a conscious choice by the director or not – lends itself to a certain creepiness. Characters speak with subdued and blunted melodies, and philosophical conversations between mother and daughter are strewn amongst drawn-out silences. Other moments in the film are highly stylized, like the scenes where Gwen joins some wealthy mothers for tea, who wear garb reminiscent of Marie Antoinette. Warning us that a digital focus leads to a moral drift, Phang commits to the impassive tone by overriding human sentimentality with the cold connotations of technology (and by extension our growing social isolation). Yet, it’s this very lack of feeling within the film that ultimately leaves us, too, emotionally detached. Establishing the world is one thing, but caring for the characters is another, and the balance between the two feels unfortunately mismatched. Similarly, there’s very little humour in Advantageous… In fact, there’s none. It stays on track with the mechanical and philosophical, without veering onto a lighter path. While there’s some dramatic tension, there’s no way it would be confused as a thriller, and it offers little in terms of romance or even climactic horror, in the way that many sci-fi movies dip their toes into (if they, indeed, had toes). It’s tonally subtle to be sure, but maybe because of this, the film feels dense, and the themes sag. In an unconscious echo of the world Phang creates, Advantageous has so many ideas that it tangles itself up. Ultimately, it’s all slightly too much. There are some incredible concepts, and some insightful comments on society, but they fail to come together in a way that would be most powerful. Motherhood, feminism, the western world and our reliance on technology are all big themes that don’t find the crispness or weight that they deserve. Nevertheless, Phang softly stirs her pot of ideas, from which noxious fumes rise, to jolt us awake – the smell of something terrible; something in-waiting; something that we’ve already started to cook.